Apple cider is a perfect base for all sorts of drinks. From hot apple cider—spiked and nonalcoholic—to autumn-worthy sangrias and some cozy apple cocktails featuring soft and hard ciders, these drinks are perfect for entertaining as the temperatures drop. Whether you're hosting a fall harvest party or looking for a comforting drink to enjoy on a chilly night, apple cider offers many possibilities. Pick up some fresh-pressed cider from a local orchard and enjoy a taste of the season. 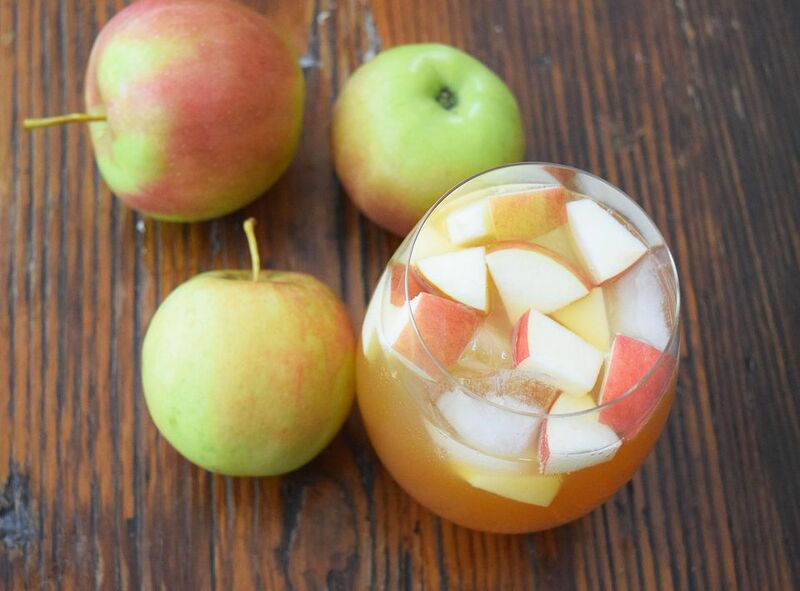 Kids will love this delicious salted caramel apple punch. Tantalizingly sweet and bubbly, the recipe mixes cider and orange juice with ginger ale. The real treat comes in the form of a salted caramel syrup that you can also use to rim each glass. Use a chai spice mix to give your cider a new twist. This warming cup may be even more inviting with its complex flavor and all you have to add is ginger, cardamom, and vanilla, along with a small amount of black tea. If you like, use almond milk as a creamer for a dairy-free drink. Hard cider is the alcoholic version of regular apple cider and it's a fabulous ingredient for mixed drinks and punches. In this sangria, it's paired with white wine, cinnamon, and even more apples—both fresh and juiced. 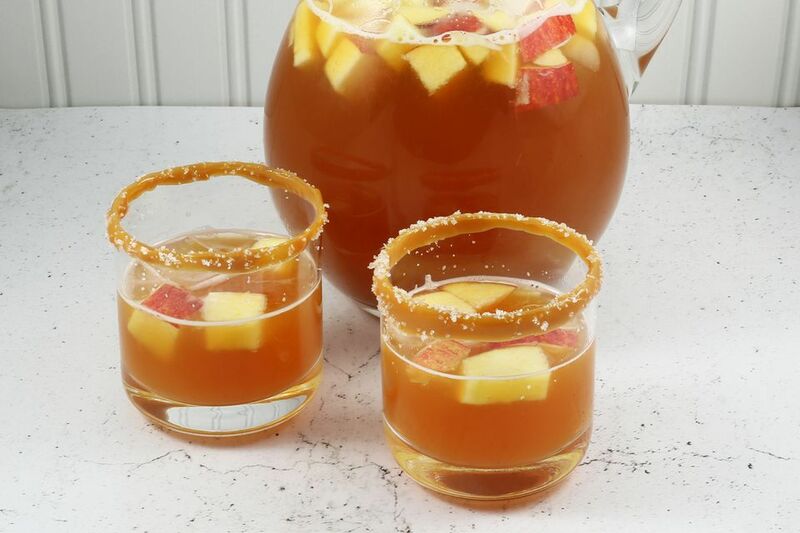 It's a fabulous way to enjoy the essential summer punch with an autumn twist. Just two ingredients are required for this sippable apple pie, a boozy toddy-like drink that's perfect for a night by the fire. The recipe features Tuaca, a vanilla and citrus liqueur that pairs perfectly with cider. Make it extra indulgent with whipped cream and cinnamon, just like its namesake dessert. The apple pie martini is another favorite drink among home bartenders. Vanilla liqueur, cider, ground cinnamon, and lime make it a vodka drink that's both easy and impressive. This autumn-worthy sangria is a serious crowd-pleaser. Inside the sparkling punch, you'll find caramel-flavored vodka, ginger liqueur, bubbly white wine, and apple cider. Serve it alongside seasonal treats like pumpkin spice scones and you'll have an unforgettable party. Use your crock pot to make a hot apple cider that's perfect for a party or holiday family gathering. The recipe mixes essential cider spices with brown sugar, allspice, and clove-studded oranges. Let the flavors meld and heat for a couple hours, then keep it warm and have guests help themselves. Hot apple cider is a favorite drink for many and this four-ingredient recipe is one you'll come back to every year. ​It's nonalcoholic, so anyone can enjoy it and it warms up quickly, filling your home with the cozy aroma of cinnamon, cloves, and nutmeg. When cold winds blow, the hot toddy becomes a drink many people turn to. For something a little different, switch out the tea for cider and add honey and whiskey or apple brandy. Your cold-weather party is sure to be a hit with the Hot Gold! The spiked warm punch pairs cider with dark rum and Goldschäger, the cinnamon schnapps infused with gold flakes. It's also spiced and can be made on the stove or in your slow cooker. You can make this wassail with or without rum, so it can also be a nice nonalcoholic punch if you have young partygoers. Cranberry juice makes an appearance in the recipe, along with all the usual spices. Warm and inviting, it's ideal when you have guests over for the holidays. Whiskey is the star of this comforting punch. The Steelers Cider is perfect for tailgating or watching a game at home. Cider, cloves, lemon, allspice, and cinnamon act as the ideal complement for a great bourbon and the cups are sure to keep everyone nice and warm. Start the season off with an apple cider martini. This simple, yet elegant cocktail pairs top-shelf vodka with apple cider, ginger liqueur, and a splash of velvet falernum for a complex flavor you'll love. If you prefer tequila, this is the cocktail for you! This sweet drink is ideal for dessert—it's simply too hard to resist the combination of butterscotch schnapps and apple cider. Mix up a round for friends who stop by or use it to celebrate any special occasion. Transform your Moscow mule into an autumn delight with the apple cinnamon mule recipe. Adding apple cider makes a world of difference and it gets a new life when paired with your favorite ginger beer. Pumpkin pie vodka and apple cider combine with club soda for the ultimate Thanksgiving sipper. As you might expect, the cider is designed to go with a holiday feast, though it's a great choice for any fall or winter event. A must-have cocktail for autumn, the Chimayó is a favorite in New Mexico during the apple harvest. This tequila recipe is best with unfiltered apple cider, which brings out the sweet fruitiness of crème de cassis. Irish whiskey and hard cider are a perfect match in the Tully 10. It's a little more interesting than pouring those two ingredients, though. You'll also muddle mint, which gives it a julep-y feel. Snakebites typically consist of Yukon Jack, beer, and cider, but this recipe takes that trio to the next level by adding fresh raspberry juice to the mix. It's fabulous with a rich vanilla porter. Bacon lovers simply have to try this drink. The Bacon Me Angry begins with a DIY bacon-infused vodka, maple syrup, and bitters. It's then topped off with hard cider to create a drink unlike any other.